Erin Dong ’18 knew from a young age that she wanted to study biology. While at the University of Rochester, she supplemented her coursework with stints as a volunteer in rehabilitation physical therapy at the Medical Center and as a research assistant in the School of Nursing. But what surprised her during her time at Rochester was that she also developed a love of dance, leading her to double major in both biology and dance. For her senior capstone project, Dong created a dance called “The Beautiful Awful: Experiencing Grief Through Movement” that combines aspects of both her majors. Along the way, she learned important lessons about the creative process, taking risks, and the wisdom that can come from failure. 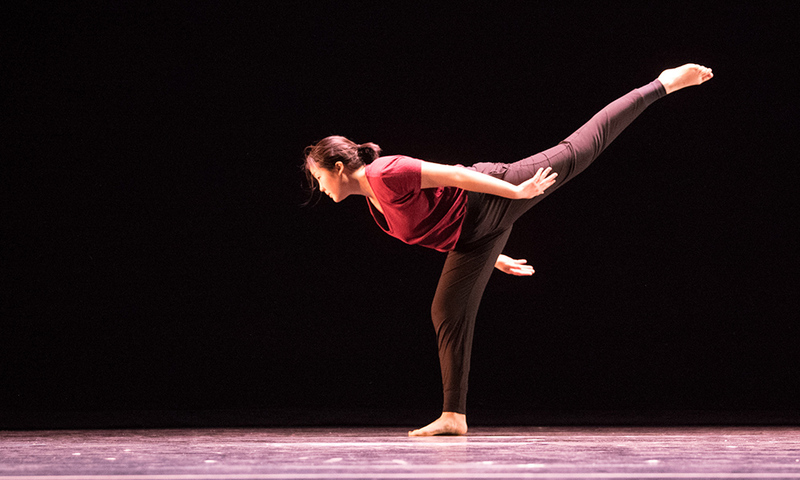 Dong started her project by examining other performances, specifically Bill T. Jones’s piece “Still/Here” and “Dying and dying and dying” by dance company MBDance, who visited Rochester in January. For his piece, Jones hosted a series of “survivor workshops” with the terminally ill and had them map out their lives and deaths by moving in a space. “Dying and dying and dying” depicted various endings in life, such as the death of an individual and of a culture. Inspired by Jones, “I realized that if I wanted to make something that spoke to a larger audience, I had to first find a topic that resonated with me,” Dong says. Dong realized she wanted to create a similar kind of space in her own dance—one in which people would have an outlet to grieve freely. She turned to her knowledge of anatomy and physiology to create a piece that incorporated not only the emotional aspects of the grieving process, but the physical symptoms as well. The body is the dancer’s instrument; therefore, a sound understanding of the body’s anatomy, mechanics, and the functions involved in movement are important in dance, says Anne Harris Wilcox, a senior lecturer in the Program of Dance and Movement at Rochester and Dong’s faculty mentor. Dong researched the somatic symptoms associated with grief, such as fatigue, chest pains, and shortness of breath. During her first attempt to choreograph the dance, she used the stage to represent the human body and dancers to represent different emotions. She wanted audience members to be up on stage and have the dancers talk and interact with them. Dong overhauled the project to better satisfy her vision of a piece that would walk the audience through the grieving process, similar to the way a counselor might guide patients through talk therapy. In her second attempt, Dong collected qualitative data, asking individuals to describe their emotions and bodily sensations when they first heard they had lost a loved one. She modeled each section of her new dance after a different element of grief and included spoken text, taken verbatim from what people had told her when recounting their own experiences. The final product is a meditation on grief that brings together science, emotion, and creative movement. But it’s the lessons she learned from the process that Dong will carry with her as she begins graduate studies. This summer she starts a three-year, doctoral-track program for physical therapy at the University of Pittsburgh.